General Motors spearheaded a research project in 1995 into making robots so safe that they could literally work hand in hand with people. Twenty-three years later, cobots (collaborative robots) have found a place on many factory floors. So, what is the difference between traditional robots and cobots? Classic industry robots are powerhouses that carry out their work following a fixed program, without regard for the people working around them. Fences and cages are used to prevent accidents. Cobots, however, are specifically designed to work together with people, not just for them. Rather than using fences and cages, they work in a cooperative environment and assist with complex tasks that cannot be fully automated. E.g. they can hand components to human co-workers, who perform the more precise assembly or quality control tasks. Cobots fulfil tasks that could be too risky for people, such as safely transporting sharp, pointed or dangerous bolting work. This results in fewer accidents and leaves operators to focus on less laborious aspects of production. Cobots are designed to work seamlessly together with their human colleagues. They stop at the slightest touch thanks to sophisticated sensors, to prevent any danger to nearby people. Closed areas and safety fencing are no longer needed. Cobots are very easy to program. Unlike traditional industrial robots, which require specialised programming skills, some cobot models even learn independently. For example, a user performing a movement with the robot arm, which the cobot can then automatically reproduce. Other systems can be given work instructions without coding using a graphic user interface. Employees can therefore flexibly reprogram cobots and use them for a variety of tasks. 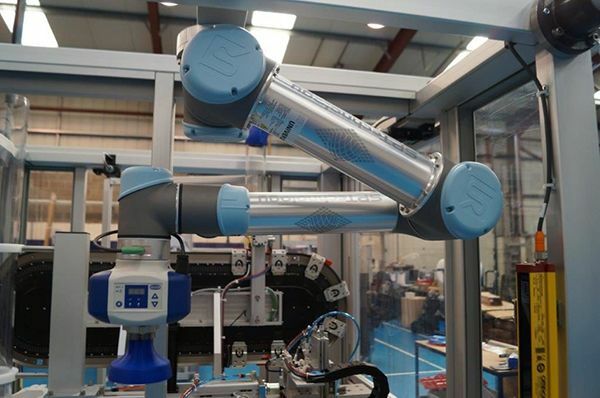 Not only are cobots easy to reprogram, they are also relatively easy to move and utilise at other points on the production chain. Most cobots can be mounted on any surface – horizontal, vertical, on the ceiling. And they are often light enough to be carried by just one person.